Below is a list of events, news, activities and seminars that we are involved in. Please join us on December 2nd for our annual Service of Remembrance. Each year, a special Memory Tree is displayed and decorated with twenty-two karat gold tone angel ornaments. These ornaments represent those we have served during the year. All are welcome to stop by our Gastonia or Belmont locations anytime during normal business hours to view the trees. During the service, light a candle in memory of your loved one at the altar. Light refreshments will be served following the service. 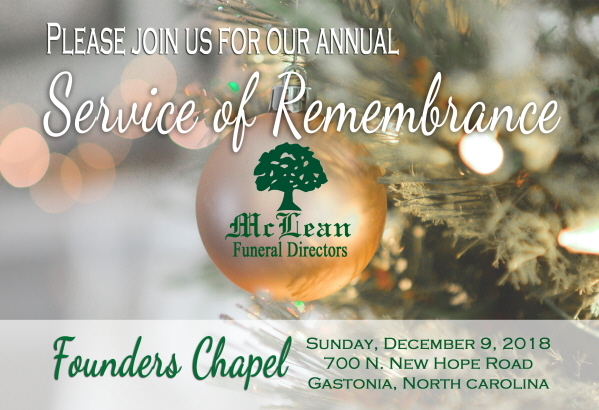 Please join us on December 16th for our annual Service of Remembrance. Each year, a special Memory Tree is displayed and decorated with twenty-two karat gold tone angel ornaments. These ornaments represent those we have served during the year. All are welcome to stop by our Gastonia or Belmont locations anytime during normal business hours to view the trees. During the service, light a candle in memory of your loved one at the altar. Light refreshments will be served following the service. At the December 4, 2017 Annual Holiday Meeting for the staff of Gaston Hospice, representatives of Mclean Funeral Directors of Gastonia, Belmont, and Lancaster, SC awarded Marla Ivestor of Gastonia as the 2017 McLean Funeral Directors Caregiver of the Year Award. She received the Annual Award which included a plaque and an all expense paid vacation to a North Carolina Mountain resort. The Awards program began in November of 2016 to honor the dedicated caregivers that serve the families of Cleveland, Gaston, Lincoln, and Mecklenburg County of North Carolina and York and Lancaster County of South Carolina. It is open to any hospice employee or volunteer who provides care or support directly to a patient or their family including nurses, nurse's aides, social workers, bereavement staff and chaplains, volunteers, and office support staff. 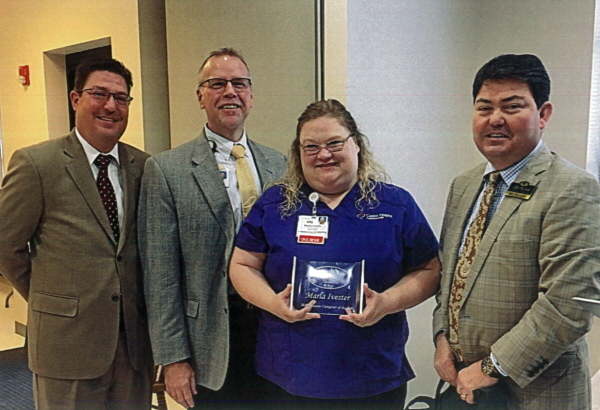 Each monthly caregiver award recipient receives a meal for fellow staff members which is provided to all, a plaque, and a $100 gift card.